Newcomers are offered a Welcome Bonus freeroll just for joining, and there is a 100% signup bonus for the first deposit up to a total of $500. Thereafter, additional deposits qualify for weekly freerolls, and up to $100 can be earned just for referring friends to Titan Poker. The downloadable poker room at Titan Poker uses Playtech software licensed in Kahnawake, a Mohawk Indian Territory located in Canada. 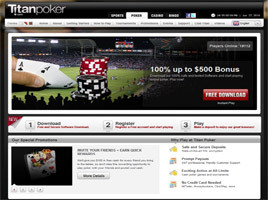 It is a member of the vast iPoker Network, and its rooms maintain the largest number of registrations and highest player traffic of all affiliated iPoker web sites. The Titan brand also extends to casino, bingo, and sports betting online, which are all interlinked via tabs at the top of their respective web pages. Fourteen different European languages are supported in addition to English, which is the primary mode of communication at Titan Poker. The rooms at Titan Poker offer the five most popular poker games on the Internet: Texas Hold'em, Omaha Hi Poker, Omaha Hi-Lo Poker, 5-Card Stud, and 7-Card Stud. There are limit, pot limit, and no limit cash games going all day long. Some 15,000 players and 1,500 tables can be expected to be active at any time of the day or night. More than 100 daily tournaments are scheduled along with a number of weekly special events, with buy-ins ranging from $1 to $300. Multi-table, single-table, and satellite tournaments are all available at Titan Poker. Freerolls, Freezeouts, and Guaranteed Jackpot tournaments can be found listed on the schedule, along with Speed games, Turbo Re-Buys, and even a few six-players-per table events. VIP invitational tournaments are conducted at least six times a month. The Lobby at Titan Poker displays lists of all the players who are online, the games being played, and all of the tournaments "upcoming", "finished", or "open for registration". Information can be sorted alphabetically or numerically with just a click on the heading of any column. Navigation is quite easy, and links are provided for ready access of the Poker Cashier and 24/7 Help. Poker room controls feature such options as Auto Muck to fold a hand during a losing showdown without revealing cards and Auto Post to put up blinds automatically when required. There is a chat function to communicate with other players at the table, and it is possible to join up to eight different games simultaneously, switching between tables quickly, by using the Table buttons located at the top left corner of the table window. Several side games and casino games are also provided for players' amusement, and some feature huge progressive jackpots. Among these is the Bonus Bears video slot, which recently paid out $1.3 million to a lucky player from Italy. The Beach Life Slot has a seven-figure jackpot to pay, too. Other games include single-zero Roulette Pro, Blackjack, Lotto Madness, Millionaire's Lane, and Casino Hold'em - all products of Playtech. All players on Titan Poker are eligible to earn Points as part of the web site's reward program. Those who gain a sufficient number of Points in a single month become members of Club Titan, with its exclusive VIP benefits. Points accrue at a rate of 17 per dollar spent on tournament fees or on a sliding scale based on the amount of the rake taken in during cash games. Points can be redeemed in the Club Titan Store for cash bonuses and tournament tokens. Other promotions here include the progressive Bad Beat Bonus for losing with a powerful hand, such as four Kings or better, and the ongoing "Top Hand of the Day", which awards $100 to any four Kings or better when both hole cards are used in the hand playing Texas Hold'em. Season promotions are also offered.